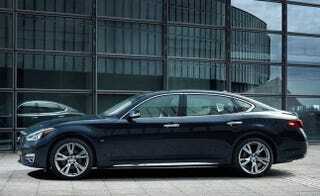 Why is Infiniti Still Getting Flacked For a "Confusing" Naming Scheme? Q for cars, QX for when that car is lifted, and a number divisible by ten denoting how high the starting price is in relation to the rest of the lineup. Done! How did G, M, EX, JX, FX, and QX get a pass? The only issues are that the QX70 has the wrong name and the current QX60 is on the wrong platform.